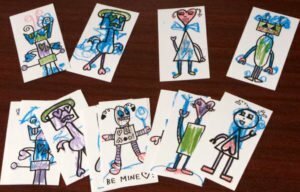 My kids and I did a fun project for Valentine’s Day, we created DIY Valentine’s Day cards using our scanner, printer, and some business card stock. I took my daughters drawings and turned them into pre-printed Valentines that they could colour in and address to their friends. It was a super simple project that turned out pretty fantastic looking, and had my girls proud to hand out their valentines, so I thought I’d share the step by step with you. I used business card stock to print out the cards. It’s a good thickness, and is easy to colour on and to write on. It is also perforated and uniformly sized, making the valentines look a bit more “official”. I gave the girls each six sheets of white art paper which I had precut into rectangles. The paper needs to be white, not off-white, and definitely not coloured. When you scan it you want to end up with just the drawing, so that when it comes time to print you are printing just the drawing, and not a rectangle of colour. 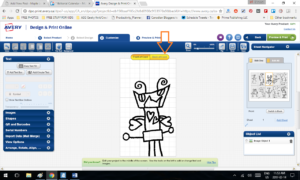 You can resize the drawings once they are scanned, so it doesn’t need to be the exact size of your cards, but it does need to be roughly the right shape, with roughly the right proportions. It is easy for the kids to draw on larger pieces of paper. You can resize the images to make them smaller when copying them over to print. Making them smaller will not make them look pixelated or odd (but blowing up an image to make it larger might). We decided to keep the drawings simple, keeping the details to a minimum. 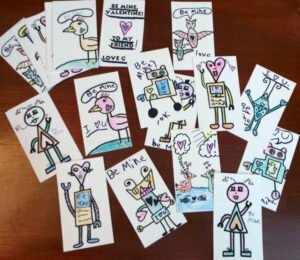 My youngest drew a bunch of robots and “love monsters” using basic shapes. The oldest created some robots and also some Valentine’s day bats and ducks.Yep, you heard me right, Valentine’s bats. Not what I would have thought up, but then that’s the beauty of this project. It lets kids create whatever valentines images they like, instead of relying on what you can find on a shelf at the local pharmacy. The girls created their drawings in pencil. Then we carefully went over them with a thick black marker. I helped with this part, carefully tracing the outlines that the five year old had made for me, trying to give everything a smooth line and clean “colouring book” look. Once we were done tracing the drawings we let the marker dry for a few minutes and then went over them with an eraser to get rid of any stray pencil marks. Using our scanner, we scanned each drawing into digital format. I scanned them two at a time. Then I opened each image in Microsoft Paint, cropped the images, and resized them. If there are any stray pencil marking, smudges or sticky finger prints on your art you can clean up the digital version and edit as needed. The scanned images are very large. In order to be able to quickly upload them for Step Four it is important to resize them (I went with 50% of the scanned size, what you do with them would depend on the size of your originals). I know there are some apps out there that will allow you to use your tablet or phone to scan. I can’t give any recommendations, and can’t speak to the quality, as I haven’t used any of them myself, but it’s an option to look at if you don’t have a scanner. You can find the template online HERE. You can make an account on the Avery website which will allow you to save your designs online, but it’s optional. If you only want to print them once and aren’t worried about saving you can skip this step. Based on the cardstock I had purchased I chose template #5371 (matches the product number on the packaging). Then I chose “Blank” and moved to the “Customize” tab. You have two options when designing the front of your cards. You can make a sheet of ten identical valentines, or you can make each one unique. Look at the top right hand corner where it says “Sheet Navigator”. You can click on the tabs to toggle between “Edit One” or “Edit All”. To make ten identical valentines choose “Edit All”. Then go to the left hand side where there’s a bunch of drop down menus and choose “Images”. From there click on “Add Image” and upload your image. Once it’s uploaded your image will show up on the single card in the centre of the screen. There will be a box around the image. You can grab the image and move it around the card, center it, place it towards the bottom so you have room for text along the top, etc. You can also resize the image, making it larger or smaller, by pulling or pushing on the sides of the box. Once you have the image in the right spot and sized to your liking you’re done with the front of your cards. If you look at that “Sheet Navigator” box you will see that your drawing is now on all ten of the cards. To make ten different valentines cards mouse over to that “Sheet Navigator” box and choose “Edit One”. Now when you upload, position and resize an image it will show up on just the one card. You’ll notice that card is highlighted in the “Sheet Navigator” box. When you are done setting up that one card front click one of the blank cards on your sheet (in the “Sheet Navigator” box) to add another image. Repeat until the front of the sheet is full. Now you can choose a message to preprint on the back of your card. There are two buttons just above the card image in the centre, “Front of Card” and “Back of Card”. Click on “Back of Card” to toggle to the back side. If you want all of your cards to have the same text make sure you have “Edit All” selected in the “Sheet Navigator” box. This year we had a bit more time to spare, and since I welcome any excuse to get the kids to practice good penmanship we made up new card backs that had a “To:” and “From:” spot for the girls to sign. However, last year when my youngest was still in Kindergarten I made the backs for her cards completely preprinted, so there was no handwriting involved at all. Once you have the front and backs of your cards all filled in you can move on to printing them out. Look for the tab along the top that says “4. Print and Preview”, click there, and then head for that bright green “Print” button in the top righthand corner. The program will transform your layout into a PDF. When you click on “Open” that PDF will download to your computer and pop up in it’s own printer dialogue window. Make sure that “Fit to page” is NOT checked off and that “Two-sided” is checked off, and then hit print. At this point if you want to make another set (say for kid #2 for example), you can just back up (by choosing tab number 3 “Customise”). Then use the “Sheet Navigator” to move from card to card deleting any images you don’t want to use, and then add new ones to fill up the blank spaces, while leaving the card backs the same. 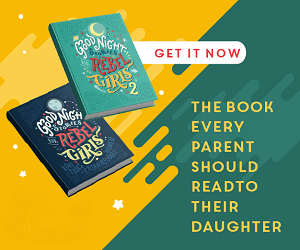 Once the cards are printed just fold along the perforations to separate them and then hand them off to the kids to colour, decorate, and further personalize to their hearts content. 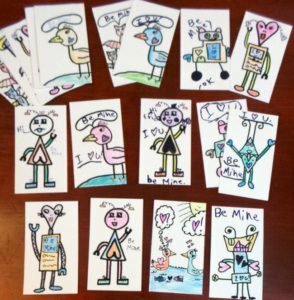 And there you go, printed DIY valentines for the kids, featuring their own original artwork. So what do you think? Would you use this to make Valentine’s Day cards with your kids? Or do you prefer the store bought cards? If you try your hand at making your own cards I’d love to hear about it. I love this, so so so much better then the cheesy store bought cards, I will have to show this to my daughter so she can do this with her daughter!! I can see my granddaughter having a lot of fun with this!! I’ve never thought to make my own Vday Cards, but come next year, I will be tempted! Thanks!